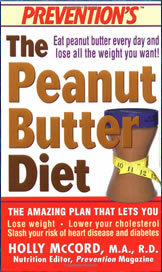 The Peanut Butter Diet is a book written by Holly McCord – a senior writer for the US health magazine Prevention. Prevention is published by Rodale. Quite simply, this is fad dieting at its finest (or silliest). Essentially the diet is nothing more than an average low calorie diet with some peanut butter in the meal plans and recipes. It is an overt attempt to gain popularity and notoriety by focusing on a single food that has traditionally been seen as “bad”. Like most fats and oils, nuts have been derided during the recent prevalence of low fat diets. However this is unfounded as nuts are good sources of mono-unsaturated fats, proteins, and other essential micro nutrients such as vitamin E.
Like all fats they are higher in calories (9 calories per gram), and need to be eaten in moderation. There is no reason why nuts should be completely eliminated from a weight loss diet. This is what the Peanut Butter diet is cashing in on. Generally any diet that espouses the benefits of a single food over all others is in danger of becoming unbalanced. The Peanut Butter diet is a little deceptive as it gives the impression that peanuts are the answer to weight loss. It needs to be said that there are many different qualities of peanut butter available in retail outlets. Some have sugar and sodium (salt) added, and other oils and preservatives. As a general rule of thumb, the more processed a food is, the lower the nutritional quality is. Natural peanut butter – with few additives is the best bet. Healthy fats have a place in our diet – but like most things – within moderation. The kind of peanut butter that you have to stir is the MOST natural. The Peanut Butter Diet Retails for $4.99. All natural peanut butter is recommended and this is more expensive. Peanut Butter can be a useful food for weight loss, but it isn’t anything “magic”. Its combination of fat and protein can help dieters feel full longer, but it is really high in total calories and needs to be eaten in moderation. I didn’t know about using peanut butter for a diet.I’m 28yrs old and in June I weighed 315 lbs and 6 foot tall. I had a hard time doing anything but walking.I have tried losing weight for years.Spending thousands of dollars. I recently went back to College while working full time and couldn’t afford much so I started eating 2 PB sandwiches a day(skippy natural) on Healthy Choice Bread. Much to my surprise I have been droPping weight like crazy! It is now Aug. And I’m 47 Lbs lighter. I can’t believe this!Its working so I have been sticking to it! I couldn’t figure out why till I did a calorie count. Each slice of HC bread is 80 cals and 2tbsp of Skippy natural PB is 80 cals so less then 300 cals a meal, My 2 sandwiches a day and milk keep me around 800 cals and Full all day long! If I only knew this years ago! I wouldve never gotten this big. Hopefully I can reach my goal of 170. My husband loves me either way, but its a bonus that I’m happy with myself. I love peanuts, roasted or sometimes deep fried and salted.. I also love peanut butter.. Now it feels good knowing it helps reduced fats. No wonder why am getting back my old figure..amazing that when we get tuned it to our body, it does know what is the best to nourish it..banana also is another, how about banana with peanut butter? ooo so yummy and healthy! If like me you were living on junk food for some time, You’ll be very happy to hear that PEANUT BUTTER is awsome. I was 13 kg overweight due to eating rubbish.In short i did some research (over the internet) and realised that if i wanted to lose weight i needed to have the proper motivation and an easy and convenient diet plan to match. I have also become a vegetarian over the last few months. PEANUT BUTTER is the perfect vegetarian protein snack top up for breakfast or dinner and even lunch if you feel like it and i had more than just 4 teaspoons per day since i dont get meat protein. Today is 50 days after i started my diet and im 13 kg lighter and my waist size has shrunk from 36+ to 33 and im 40 years old. And guess what ? i did’nt do any exercise because i wanted to see if my research conclusion was correct and it was. Dieting is not science! AND its not about purchasing a DIET concoction in a pharmacy ( what a BIG ripp off )I started off with just normal peanut butter but then i realised it contained sugar so no i purchase peanut butter that does not contain sugar. I will never ever go back to my old ways of eating junk food EVER! mmmmmm All said and done. I went on a diet aproximately 40 days ago because my waist size increased from size 33- size 36+ and everyone kept telling me that that’s what happens when you age as i’m 40. Of course i didn’t believe any of it so i decided to put myself on a diet of fruit / pro vita and PEANUT BUTTER. forty days later i dropped 12kg without excercise. ……. waist size ? back to 33. And i had more that 4 teaspoons of peanut butter per day. The best thing about consuming peanut butter is that you dont need to calorie count. Once you know what the calorie count per jar is then you know whats in every spoon. THAT Simple! Well you know the cookie diet lets you have 6 100 calorie cookies and then a small dinner, so for a peanut butter diet you could take say make three peanut butter sandwiches and cut them in half and eat one of those halves when you are hungry only to avert hunger… then have a small dinner… don’t eat anything else. I have been trying to do this with Two Arnold or Pepperidge farm rye bread peanut butter sandwiches and I cut them in thirds and eat as necessary to avert hunger. I also found this stuff called WASA Rye which is like a low calorie cracker, only thirty calories a slice, and you could make peanut butter sandwiches with those. Three sandwiches would be 3X60 for the bread =180 calories plus 3X200=600 for the peanut butter so you would have approx 750 calories in those three sandwiches… cut them each in half and have 125 calorie snacks which you eat only to avert hunger. Then have a small dinner. Unfortunately peanut butter has been recently linked to liver cancer. Be wary of any protein. This new protein craze is causing Americans to consume more and recite the “protein is good” mantra. There is a reason why it makes you fill full, your body can’t break it down efficiently. It is healthier to eat lower protein options (not necessarily higher CARB), consistently throughout the day. up until high school, i ate peanut butter with every meal. pb on toast for breakfast, pb crackers for snack, pb with apple slices for lunch, pb sandwich for dinner. during high school I gained 75 lbs, weighing in at 150lbs. I’ve been on the peanut butter diet for 1 month, and with light excercise,I’ve lost 11 lbs, so I now weigh in at 139. I’m going to keep at it. i love peanut butter but i just don’t get the plan. do i only eat peanut butter. does this actually work :S? What aren’t you allowed to eat?! so you eat only peanut butter? anyone have the plan or anything? Peanut butter my Best friend!!! I luv peanut butter!!! Yummy! Yay yay yay!!! Yeah, It`s so good and so delicious!!!!!!!!!!! !